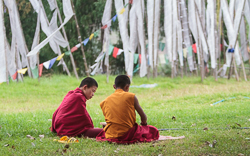 The best parts of any trip to Bhutan are the things that aren’t on our itinerary. It may be following a group of young monks to the rooftop to photograph them throwing rice balls into the valley below, or stopping at a schoolyard to play soccer with the children, or finding a child we photographed on a previous trip to see how they’ve grown and to find out what they’re up to now. Whether it’s stopping to photograph a herd of yaks on the road, or monkeys in the trees, or hanging prayer flags at Dochula, Bhutan never disappoints us for its charm, mysteries and beauty. It truly is the trip of a lifetime. One of the primary reasons we love Bhutan is the people. They are gracious, welcoming, good-natured and handsome. One quick look shows you how much we love to photograph them and with each visit we begin to understand a little bit more of their culture and attitudes. Bhutan’s most famous and scenic icon. The climb is steep and takes about 4 hours round trip. 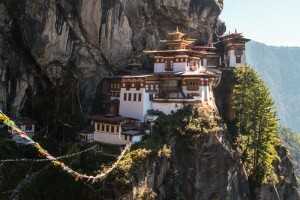 An important place of pilgrimage and refuge for more than 1200 years, Taktsang Monastery, also know as Tiger’s Nest, clings to sheer cliffs 2000 feet above Paro Valley. This sacred place got its name when Guru Rinpoche rode there on the back of a flying tiger and meditated in a cave behind the present-day monastery. The monastery of Dzongdakha derives its name from the word ‘Dzongdaphu’ meaning a ‘cliff which looks like dzong.’ The monastery is located to the west of Paro Town and about 400 meters from the valley of Bondey. It has a very rich history dating from the 8th to 13th century. There are three main temples and each one has its own history. The oldest temple is where Guru Padmasambhava meditated around the 8th century and hid a treasure inside the rocks. Enjoy the spectacular views of the Eastern Himalayan Mountain ranges. Take a walk around the 108 stupas which decorates the pass. Also visit the Druk Wangyel lhakhang built by the four Queens as a tribute to the fourth King of Bhutan, and hang your set of prayer flags among the thousands already there. It hosts the administrative seat of the district. The Dzong lies between two rivers, the Pochu and Mochu, male and female river. It was built in 1637 AD. It was here in December 1907, that Bhutan’s first king was crowned. This ancient fortress is considered to be one of Bhutan’s most beautiful. Punakha is the former winter Capital of Bhutan and now the winter residence of the central monastic body. Subject to change, but these are the tentative reservations we’ve made. We work with one of Bhutan’s oldest and most reliable tour companies which allows us to book some of the best hotels in the country. As we travel all the way across the country, the accommodations will become more spare, but always warm, clean and comfortable. Nak-Sel Boutique Hotel – By far our favorite hotel in Bhutan. Owned by a personal friend, the luxuries here are first rate, but distinctly Bhutanese. We especially love the heated floors in the suites, the hot-stone bath in the spa, and the excellent food and service here. Hotel Lobesa – It may not have a website yet. This brand new hotel is owned by a friend and former guide, who also owns one of our favorite restaurants in Bhutan. Namgay Heritage – A traditional Bhutanese architecture with modern western amenities, it’s our favorite in the Thimpu. ates and to experience the traditional architecture of their home.